During our whirlwind 36-hour Michelen star chef fest, we somehow fit in time to check out a couple newish spots on our Vegas radar. 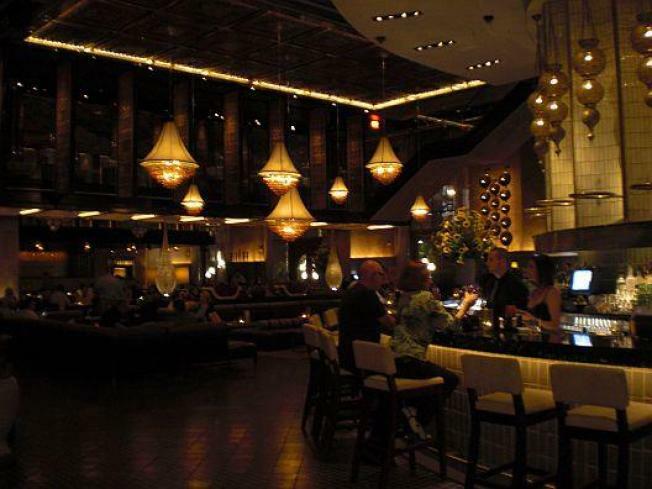 First, Ludovic Lefebvre and Lavo, the restaurant and nightclub that opened in the Palazzo two months ago. This isn't the Ludo we knew at Bastide or even Breadbar, but if you look hard enough, his influence is definitely there. The menu is a mishmash of Mediterranean and Americanized dishes like pizzas, sliders, pastas, salads; odd coming from a guy who wowed us with foie gras miso soup. But this is Vegas: The restaurant sits right on the Strip, not tucked away in a quiet corner like Guy Savoy or Bouchon, and the food has to match half-naked women rubbing each other in bathtubs and the pyrotechnics of the "Sirens of TI" pirate show across the street. In essence, it has to please the masses and does. We had no intention on tasting half the menu but they sent out a few extra things to try. We're not as easily impressed with lobster truffle pizza or filet mignon topped with foie gras as, say, a Midwestern tourist, so our favorites were the most Ludofied dishes: the deconstructed Bloody Mary amuse; a beautiful plate of crudo, four, each using a different European olive oil; simple but delicious grilled octopus salad. Lefebvre is having fun seeing what liberties he can take with the menu, learning how to deal with the middle-America palate and what it takes to run a restaurant that does up to 800 covers on a busy weekend night. Could only help when he finally gets to do his own place. Oh and that accent: Hot as ever. Before making the drive back, we popped in for some burgers and milkshakes at Laurent Tourondel's BLT Burger at the Mirage. Decent burger, although our toppings were a little skimpy. The onion rings, however, were some of the best we ever tasted. The milkshakes totally rock it. The joint was getting swift business from all types. Soon every resort will have a gourmet burger place—there's already Hubert Keller's Burger Bar at Mandalay Bay, Red Rock has LBS, there are unconfirmed rumors that Thomas Keller wants to bring his Burgers & Half Bottles concept to the Venetian, Bobby Flay wants to do one at Caesars, and there may be something at the Wynn down the line. And that's the Vegas restaurant scene in a nutshell: Someone hits a homerun with a new concept, everyone else follows until the next big thing strikes.